Editor’s Note: This blog post was written by Enough Project Senior Policy Analyst Holly Dranginis and Intern Adam Finestone. This week marks an important step forward for international justice and accountability for atrocities in East and Central Africa. The International Court completed its confirmation of charges hearings in the case of Dominic Ongwen, a former commander of the Lord’s Resistance Army (LRA). The LRA, is a notorious armed group known for committing atrocities in Uganda, South Sudan, the Central African Republic and the DRC and funding its activities in part through elephant poaching and ivory trafficking. Ongwen was charged with 70 counts of crimes against humanity and war crimes, including sexual and gender-based crimes and the recruitment of child soldiers. Ongwen, indicted in 2005 for crimes committed between 2002-2005 surrendered in the Central African Republic in 2015, where he was transferred to the ICC in The Hague. His case is unique in several respects, most notably because he was abducted by the LRA and forced to be a child soldier before eventually rising to commander status later in life. Thus, this is the first case at the ICC in which an inductee is charged with the same crimes done to him. With the unfolding of Ongwen’s case, an important debate has surfaced as to what implication, if any, Ongwen’s abduction as a child should have on his case. This is an issue ultimately up to the court. In Friday’s statements, the prosecutor made a point of acknowledging Ongwen’s status as both a victim and an alleged perpetrator, but also asserted that Ongwen had command and control over troops during the massacres for which he is charged. The prosecution argues his former status as a child soldier should only serve to mitigate his sentence, if appropriate. The question of mitigating evidence based on abuses suffered during childhood and outside the temporal scope of the crimes charged is a critical one, and evolving still even in domestic criminal practice. Ongwen’s trial is a unique and important opportunity to form international legal precedent, especially since histories of abuse and abduction as well as brainwashing and Stockholm syndrome are not issues unique to Ongwen’s case. These are issues that are likely to feature in future cases at the ICC, so the way they’re handled in Ongwen’s case will likely form a foundation for how they’re addressed in international criminal law practice generally. The confirmation of charges hearing, beginning on Friday January 22 and continuing into Monday and Tuesday, was primarily for the prosecution to present its case to the judges in order to convince them that there is enough evidence to proceed on all 70 counts. The judges can drop charges at this stage if there insufficient evidence, a decision that will be released in a few weeks after the judges have a chance to review evidence presented. As the case moves forward, the prosecution will use a fairly diverse range of evidence, including testimony, exhumed remains, and radio intercepts. On Friday, prosecutors presented an especially sophisticated analysis of coding that the LRA has used in its radio communications. In addition to the defense and prosecution teams, there are two teams of lawyers representing almost 2000 victims in the case, who also presented statements in this week’s hearing. The ICC is the first international court to incorporate victim participation, which is still considered an innovative or experimental component of international criminal justice practice. Click here to read more on the Lukodi screening. 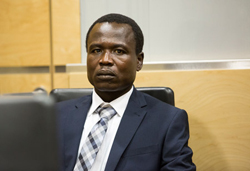 Click here to read about the basics of Ongwen’s case on the ICC’s website.